To summit up, Verbier's one and only mountain-top ski shop. 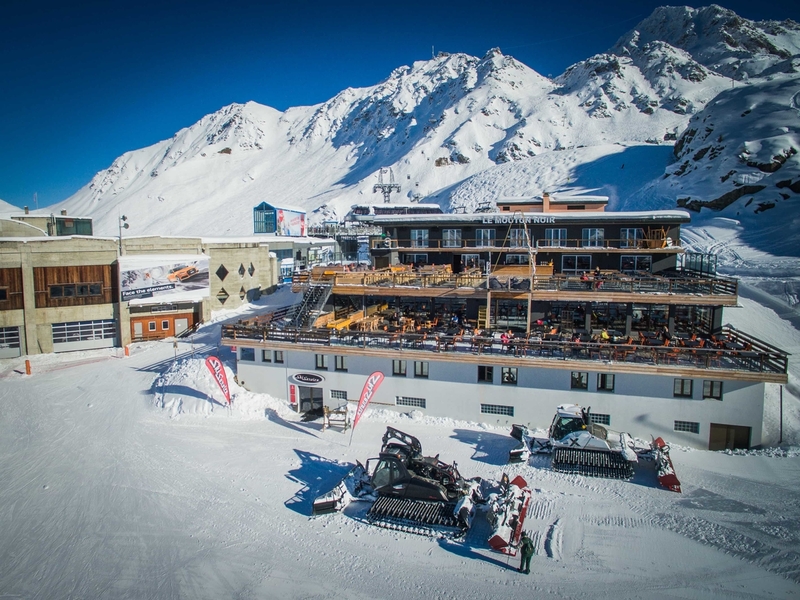 Created with the simple idea to make getting onto the slopes even quicker and easier, Ski Service Les Ruinettes allows you to get straight onto the mountain with the minimum of stress and the maximum selection of equipment and accessories. Here’s a closer look at what we’ve got. SKI HIRE*: Just because you came up without skis doesn’t mean you can’t ski back down. At Ski Service Les Ruinettes you can rent skis and equipment directly on the mountain and even drop them off there or back in Verbier when you’re done. If you are not staying in Verbier and are getting up the mountain from Le Châble then collecting your equipment and leaving it overnight at Les Ruinettes could prove particularily convenient. Book online now and save 23%. 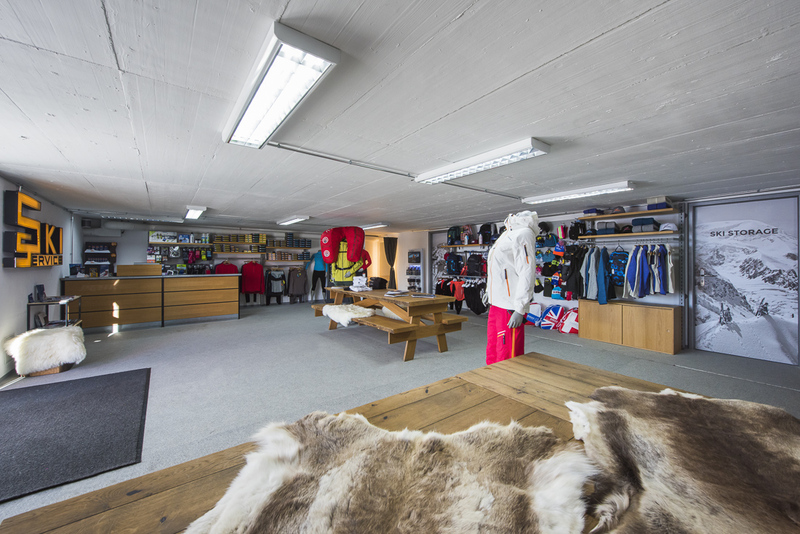 If you don’t have clothing and don’t want to splash out and buy something you may only use once a year then why not RENT SKI CLOTHING at Les Ruinettes? High quality The North Face and Pure black jackets and pants are available on site in a full range of sizes for both adults and children saving you valuable space in your luggage. You can also hire Scott goggles, Hestra gloves and our own Verbier designed beanies all available in adult and kid sizes. 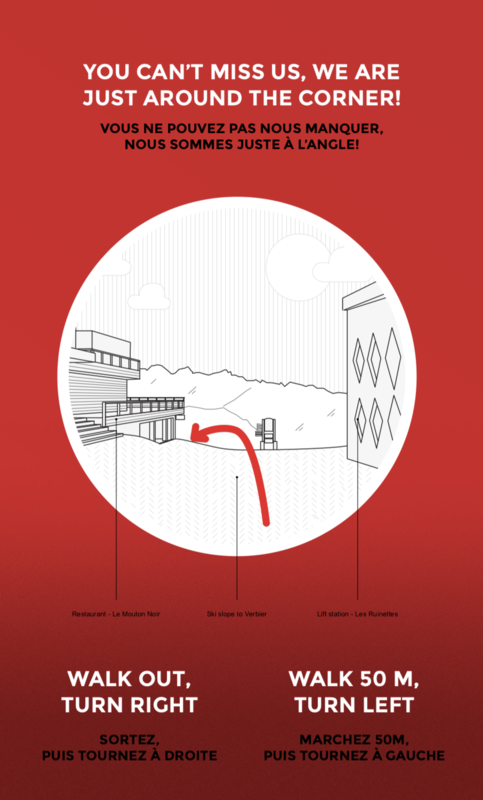 By booking with our ONLINE SKI RENTAL* at www.skiservice.com your skis and equipment can be collected directly from Les Ruinettes allowing to head straight for the télécabine when you arrive in Verbier or Le Châble. Don’t forget that there’s also a minimum 15% discount for all online rentals. 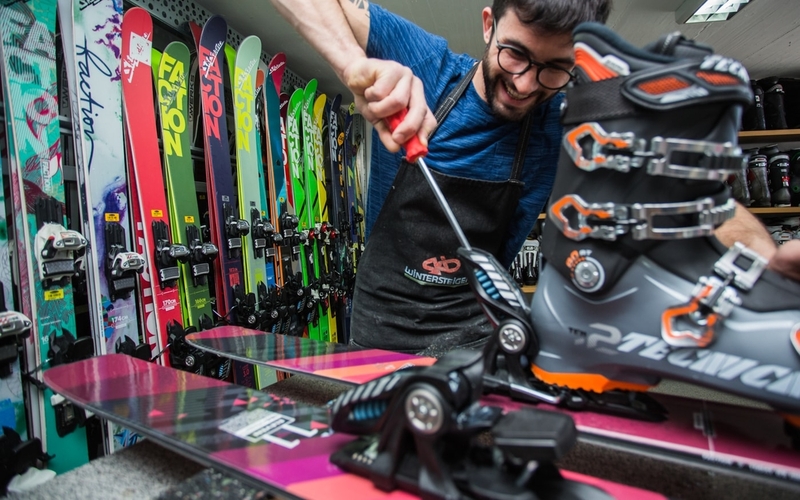 The other convenience with our mountain-top shop is that, if you don’t like your skis, or just fancy a change, you don’t have to go back down to Verbier to do so. With SWAP & EXCHANGE* we offer immediate and unlimited equipment changes, so maybe you’ll end up snowboarding down after all. 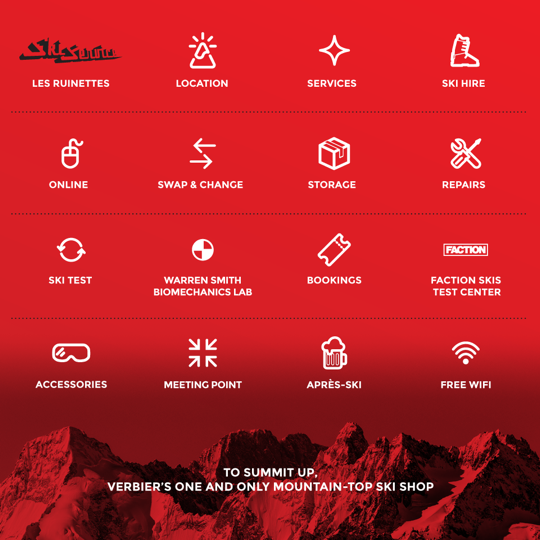 With a full selection of skis to buy from Ski Service why not use Ski Service Les Ruinettes as your test location and get as many planks under feet in a day as possible. 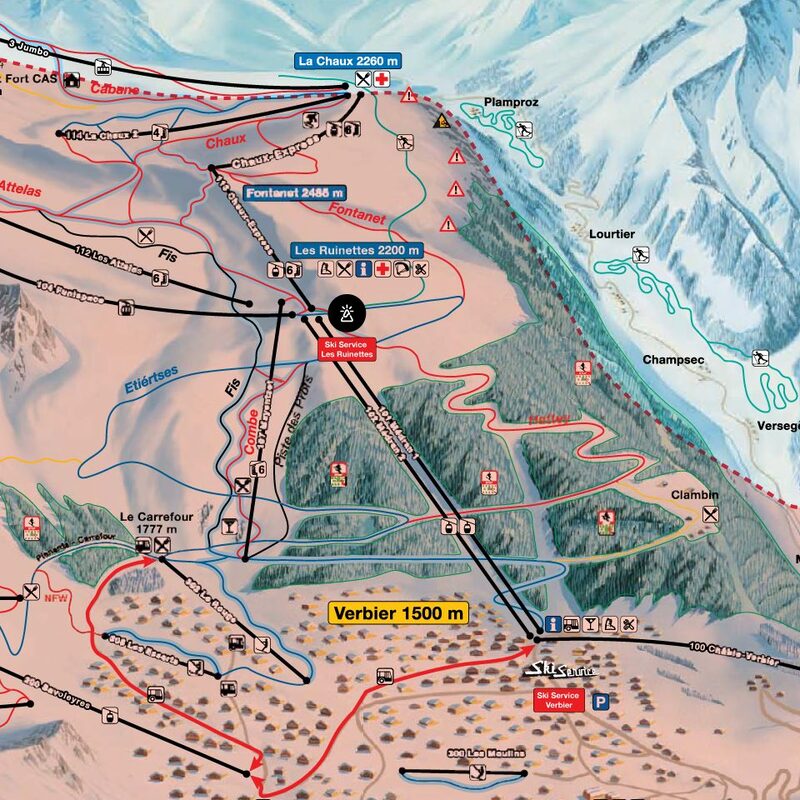 The location cannot be bettered and gives unparalleled access to skis and terrain right at the Ruinettes lift station. No longer will you need to go back to Verbier to test your next pair. This SKI TEST**option allows you to try any number of skis before you buy them in order to make sure they’re just right for you. Free x-country afternoons. Every Wednesday afternoon you rent cross-country skis and boots free of charge. The cross-country tracks starts just outside the shop and makes its way along the mountain side to La Chaux. Free ski tests. Every Sunday different brands from Faction to Zag and Atomic to Kästle are putting on free ski tests all day long outside the shop. Past brands have included Black Diamond and DPS. For a full free ski test schedule head here. Our wide selection of over 40 models from Verbier-based ski manufacturer FACTION*, covers their full range. Nowhere will you get better convenience and choice, it's the only place to test Faction Skis! The WARREN SMITH TECHNIQUE LAB can help you iron out any niggles in your approach to skiing whilst fine tuning your equipment and technique too. Ski Service Les Ruinettes also offers secure onsite FREE SKI STORAGE* facilities, so you can leave your equipment there overnight, with your boots on the heaters, then pick them up again for the next day’s skiing. This ski, boots and bag storage is free for all our rental customers and their friends (even if they have not rented with us). Secure lockers are available to rent for the season at the cost of CHF 150 and include a free service and use of the boot dryers. There’s also a fully functioning SERVICES* and REPAIRS* workshop. So, if you need anything fixed or even just some fresh wax, drop your stuff off and we’ll do it for you while you have a coffee upstairs or overnight ready for you to collect in the morning. Forgot your gloves? Need an extra thermal layer before getting on the chairlift? We have a great selection of SKI ACCESSORIES from Patagonia jackets to Oakley goggles and Smartwool layers to hand warmers. So if you need something on the mountain, you know where to find us. BOOK your ski lessons, paragliding or other mountains activities and set off from Les Ruinettes. Les Ruinettes is selfie central, Instagram city, whatever you want to call it it's a stunning location so turn off your data roaming and get snapping. FREE WIFI at Ski Service Les Ruinettes.